If you don't have a FamilySearch account already, you'll need to create one (it is free). Log into your account, go to the catalog and search by place. Start typing the name of your ancestral town, and FamilySearch will start giving you options. Select your town. Use multiple spellings for your town. Searching for "Nezhin" finds some record sets that "Nizhin" doesn't. Search for your town with both its transliterated ("English") spelling as well as with Russian and Ukrainian spellings in those alphabets. Sometimes record sets are only listed under one and not the others, and you do not want to miss that there are precious record sets accessible from home! Be very creative with spelling. Remember that in Russian, there is no 'h' sound, so substitute g's for h's and vice versa. Don't just look for the town. Look for the district (uezd, for former Russian Empire) and province (guberniya, for former Russian Empire) as well, since some records were kept at that level, and FamilySearch hasn't broken availability down by individual towns. Once you have located your town/district/province of interest, select it, and you will get a list of any record sets that FamilySearch has. 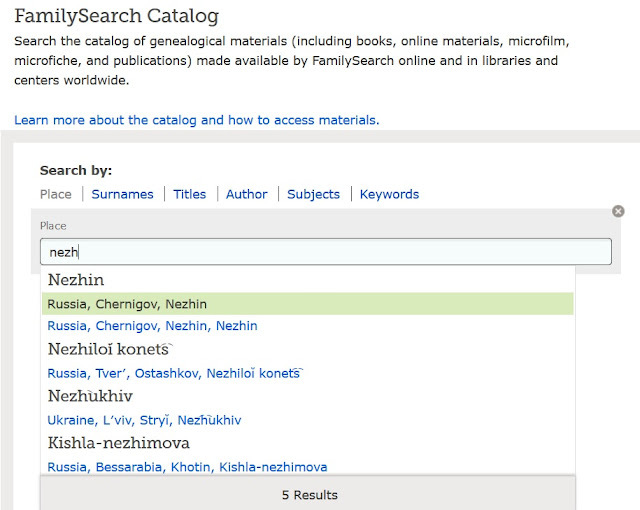 For this example, you can see that FamilySearch has two Jewish-specific record sets for Nezhin. The first is Metrical Books (these are vital records), and then second is a poll tax census (Google Translate can help you if you can't read another language). Note that there may be Jewish records in some of the other record sets here, but these are likely enumerate only Jewish individuals, while the others (particularly the civil records) will contain records with people of all religions. But before you go into the records, note the Item Number for each line, as that can help you figure out where on the film to look for the records you want. For example, suppose I want to look at marriages from 1898-1899, which is on the first line. Those marriages will be in Item 6 once you click on the camera icon. Take a look at the above image. You're looking at images from a microfilm which has been digitized. (You can zoom into individual pages using the plus sign on the top left.) Those black images show the beginning and end of each item. So to see those 1898-1899 marriages, scroll down until you see the black image that begins item 6. Zoom in on those pages, and research away! No, these records are not in English. They are in the language in use in the place at the time they were recorded. The metrical records in the example above are both in Hebrew and Russian. The poll tax census mentioned above is only in Russian. Records from Galicia may be in German, since it was part of Austria-Hungary. I do read Hebrew, but I taught myself to read old Russian--enough so I can read names and be able to identify which records are the ones I'm looking for. There are some great online tutorials to read various languages. Have these been indexed? Some have, but most have not. FamilySearch has indexed some records. JewishGen has indexed many Jewish records, and they will point you to the correct film number (so you can now find the original record, from home). But the vast majority of these haven't been indexed, so you'll need to browse through them yourself (or with the help of a friend/translator). If I don't see any records for my ancestral town, does that mean they do not exist? No! This will only find records that FamilySearch has filmed and is a small subset of records that actually exist. To see other ways to find records, check out this series of posts. Can I look for specific records for you? No, sorry, but hopefully this gives you the tools to find them for yourself. Thanks for this valuable primer. With your permission I would like to share it with our Genealogy Club here in Florida. This is so exciting to read about, Lara! I recently subscribed to your blog looking for more ways to research my Jewish ancestry. I, too, am learning to spot the important tidbits of information from online documentation written in Polish. Thank you for sharing this wonderful news! I just want to make sure I understand your response to your own question # 2: there are records on FamilySearch that are not yet even listed on JewishGen? Is that correct? Yes. There are records on FamilySearch not listed on JewishGen and records indexed on JewishGen not imaged by FamilySearch. 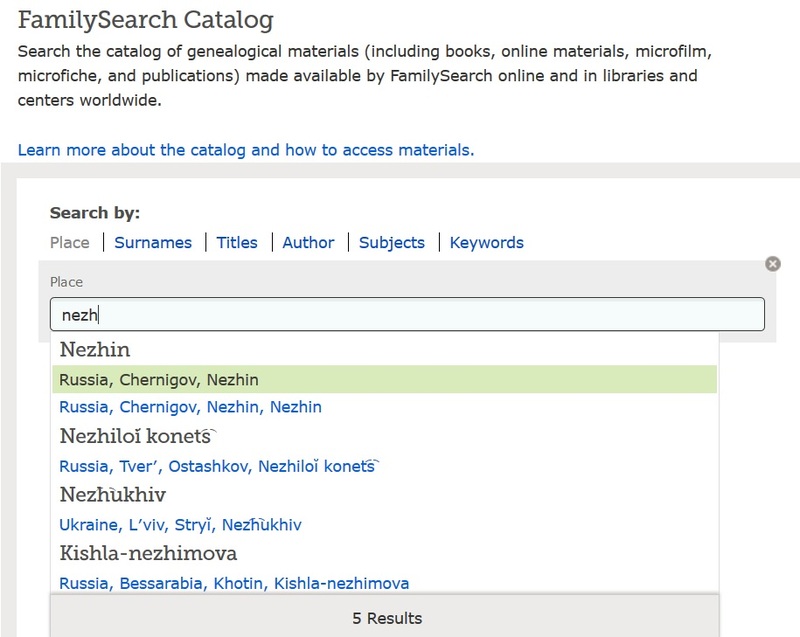 familysearch.org is still in process of having the "Ukrainian" records digitized. It is not all done yet. Oh, of course it isn't. Nowhere near.